Card 4 in my series of five masculine thank-you cards for movers. Continuing in my set of five masculine thank-you cards (to be sent to people who helped my client move), this “Card 4” is another one where I couldn’t get the brown-and-white DCWV “key” paper to work with the plaid and metallic silver-toned base. The colors just weren’t compatible enough. But I thought it would still be simple and masculine, two other requirements for the order, so I continued. I wish I knew what company this base is from. I was given a number of thick metallic bases in a craft swap, and they’ve been great to work with. 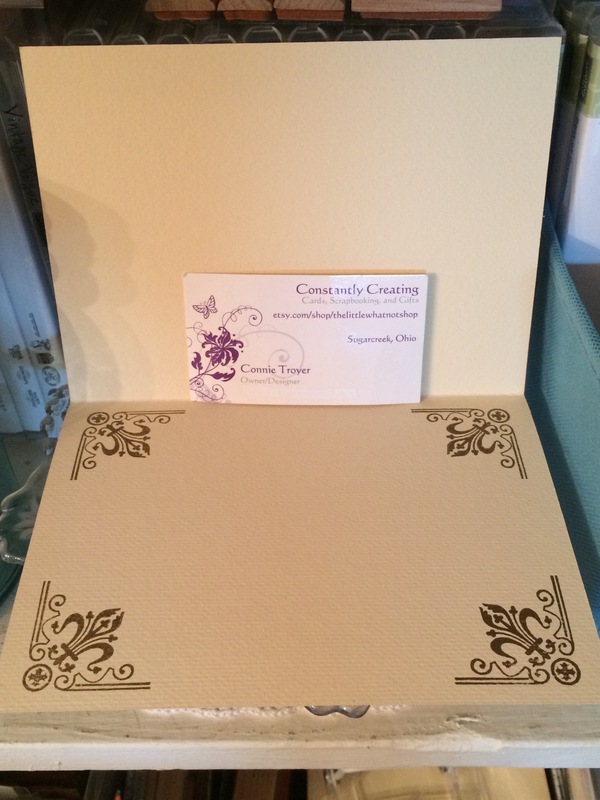 They feel thicker than the usual Stampin’ Up cardstock I typically use for my bases (those are an 80-lb card weight, I think). 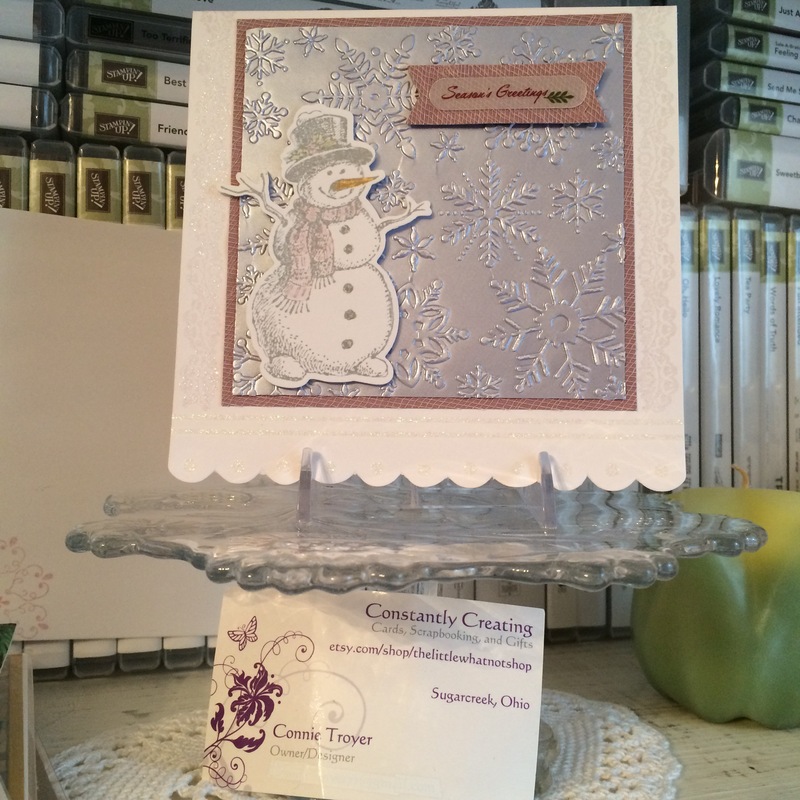 A good base is key to the card not falling over or flattening instead of standing up. The mechanics of how I did this card are simple. I’ve already mailed the cards, so I’m not sure of the precise measurements of the individual pieces, but I think the remnant plaid piece is just over 2 inches. I believe the squarish one in the middle was the back side of the grey plaid paper I used in “Card 1” (K and Company). I already had a chunk cut out of it for the other card, so one side had already been shortened. I measured where I wanted it to fall on one of the strips of the yellow-and-grey piece and lopped off the other side with my Fiskars trimmer. It actually turned out well! Though I am beginning to wonder whether my powder is too old – or maybe it’s just the brand. I don’t think my Stampin’ Up powders dimple like that, but they’re newer. And I don’t heat emboss all that much, so I haven’t really compared it to my others yet. The dimpled look is fine for these masculine cards and during other times as well, but occasionally I do want a smoother look, which seems possible with other powders. Or companies. This is something I need to research. (If anybody has any knowledge or tips, feel free to leave me a comment!) After I glued the square piece onto the plaid one with my ATG gun, I repeated the embossing process with the “for your kindness” stamp (“So Very Much, Stampin’ Up SAB set, retired). Then I sat back and took a look at it to see if the card “needed” anything else. I was pleased with how this one turned out. It fit the requirements and didn’t take overly long. In my quest to continue creating the masculine thank-you cards for my newest custom order, I went back to the brown and cream “key” paper I’d taken out of a DCWV 12×12 Stack (I think it came from “Tradewinds,” but I’m not near my supplies to check). I had to use this paper; I wasn’t sure what else to grab to signify the whole “thanks for helping us move” idea. …but I couldn’t get the sizing of the sentiment to work with the key paper and not completely hide it. In the end, since the sentiment stamp had been approved by the sender, I nixed the sketch idea and just went back to the basics: covering the majority of the card with pretty paper and layering something on top. 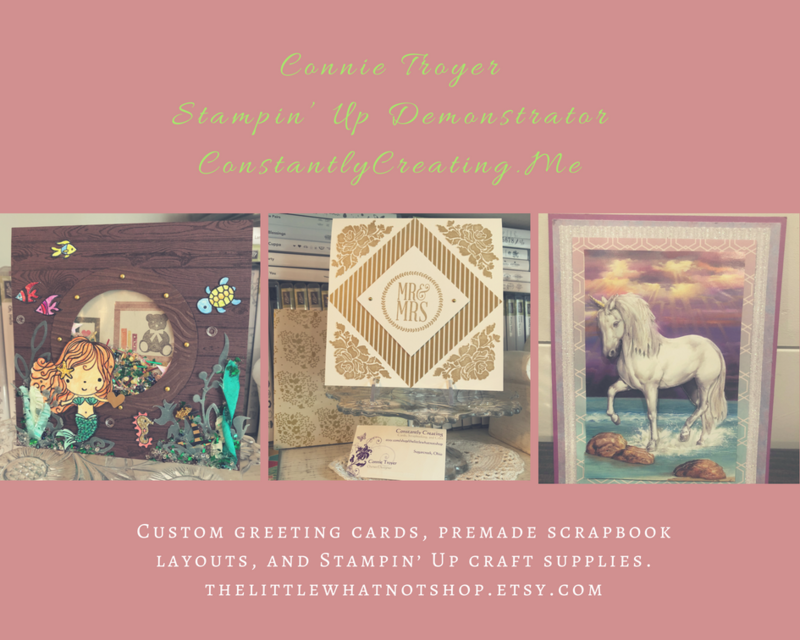 In this case, I layered the key paper and then a retired 5/8″ gold satin ribbon from Stampin’ Up across the center of the card. I did that in the wrong order, but I’ll spare you the details. I found two cream 5×7 card bases in my premade bases pile, so they were perfect to use with the coloring and the size of the sentiment stamp. I decided to ink up the edges with a dark brown chalk ink from Colorbox (Chestnut Roan?) to balance the brown in the key paper. I found a light brown paper in one of my Martha Stewart 12×12 paper pads – it was a shame to cover up the pretty blue and pink flowers on the opposite side, but there was no helping it. The brown worked better than anything else I had nearby. Once I had chosen the paper I was going to use behind the sentiment, I laid the die on top and cut roughly around it, leaving a little room. 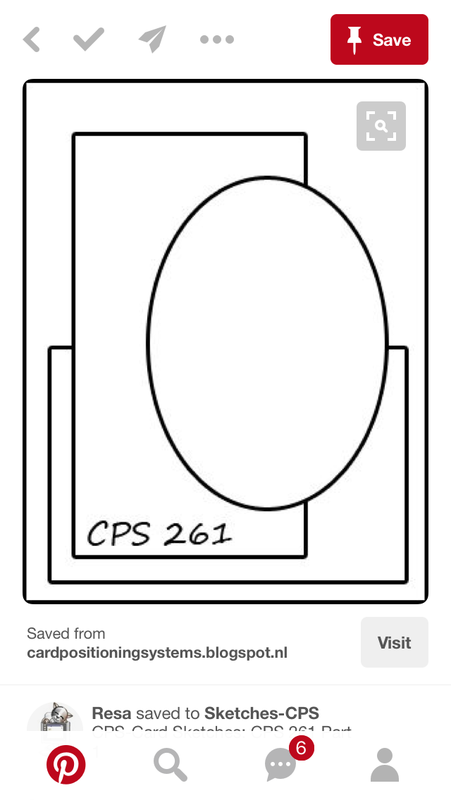 (Have to cut down the 12×12 piece to get it into the 6-inch(ish) Cuttlebug for the die cutting and embossing.) 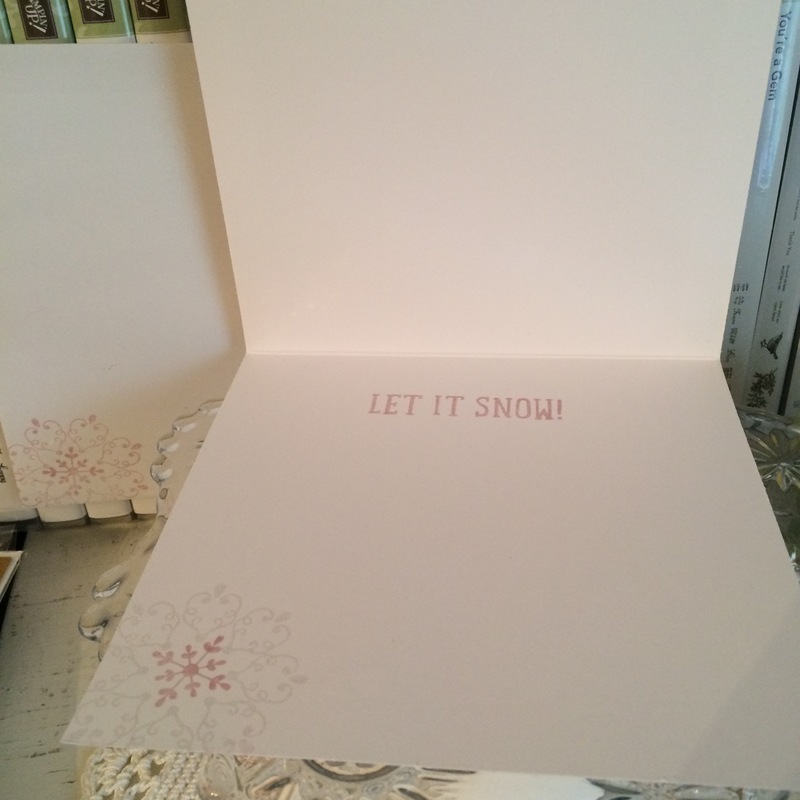 Then I started the embossing process. Heat embossing used to really frustrate me. It felt like I never got a good clean image when I was done. I’m a perfectionist and hate it when stray flecks of embossing powder attach and then are heated onto the paper where I haven’t placed ink. With practice – and with the Embossing Buddy anti-static bag – I’ve gradually gotten better at it. I keep a paintbrush in my close-at-hand tools to whisk away stray flecks upon inspection before taking the heat gun to it (thank you, Betty!). Well, even with all that perfectionistic practice, sometimes I still forget to use the Embossing Buddy. Of course I forgot once on these two cards. But I remembered on the next one. Whether or not you remember to use the anti-static bag/Embossing Buddy, the next step is to take a VersaMark pad or pigment pad or thick craft ink to your intended stamp and stamp onto your paper. The thicker ink doesn’t dry as quickly as the water-based inks, which gives you time to move the image to your embossing powder. Some people keep theirs in separate plastic food containers with lids, which I’d like to try, but I’m already short on space and own an embossing tray with a funnel. I frankly despise using the funnel. 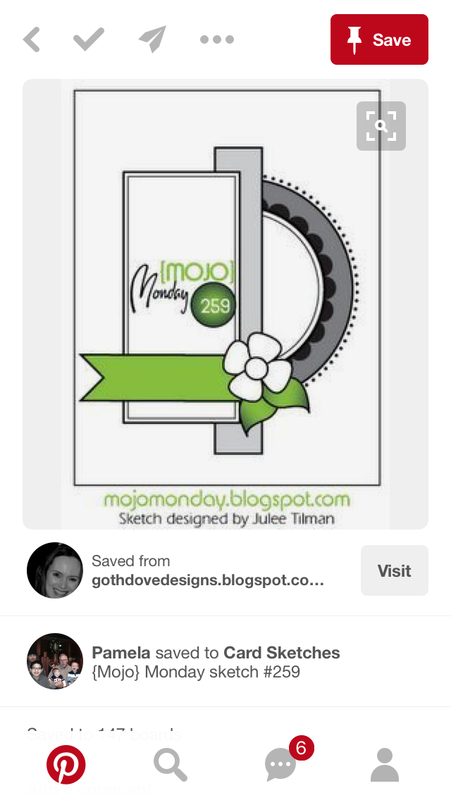 The best tip I ever saw about embossing – besides using the anti-static bag – is to use a creased coffee filter on top of your work surface, under the embossing powder. The filter catches the extra powder that is tapped or slid off the card, and the crease allows you to quickly and easily “funnel” it back into your open container for next time. No need to waste it! 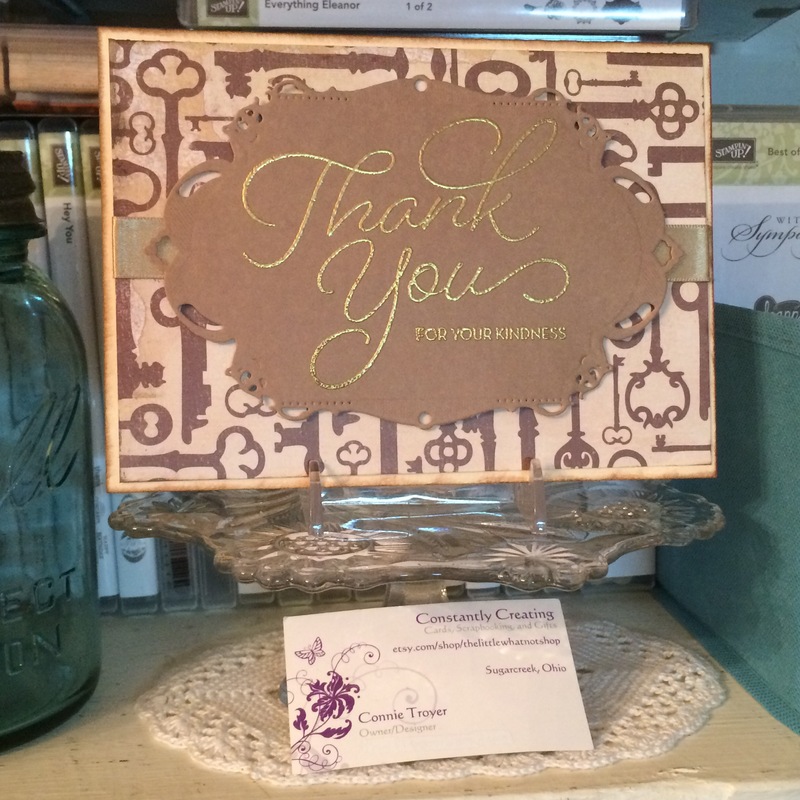 Once the big “Thank you” sentiment was done, I took the second sentiment stamp, “for your kindness” (both stamps are from “So Very Much” SAB stamp set, Stampin’ Up, retired), then inked it and repeated the process. I recentered the die over the paper on my magnetic pad (best invention EVER) and cut it with my Cuttlebug. And then I dry embossed it by flipping it over and adding the squishy and knock-knock mats mentioned above. And it was perfect. 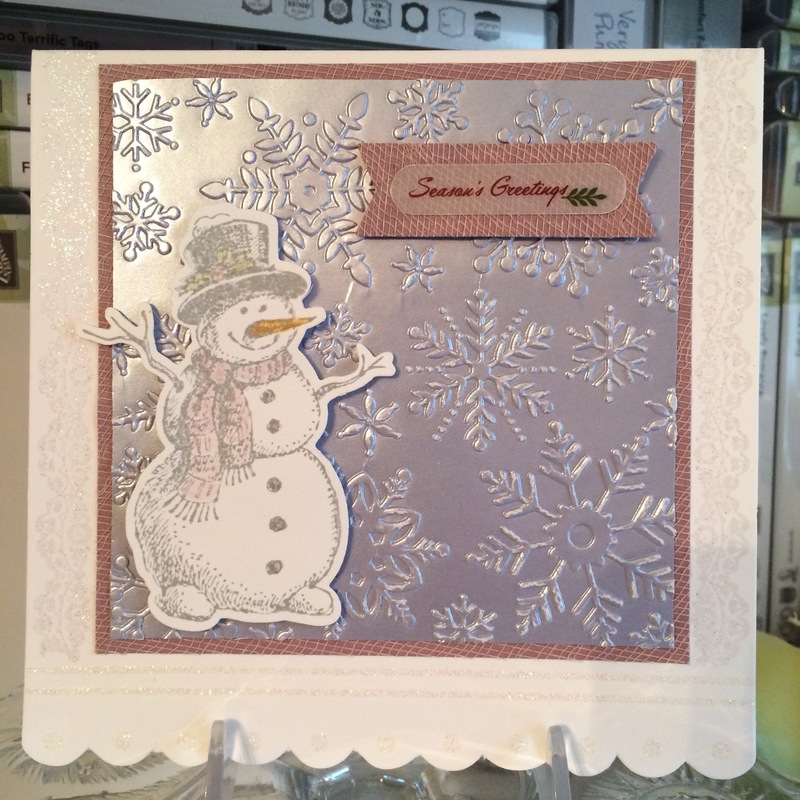 I added 3D foam dots on the back side of the sentiment piece and stuck it down on top of the gold ribbon. I thought about adding a small enamel or epoxy heart or dot off to the side of the Thank You part, but it was late and I needed to go to bed, figuring I’d think about it the next day. The next day came and I wasn’t sure it was necessary, plus it was going to take some time to figure out what, exactly, to put there and I needed to just get the order done. Besides, they’re for guys. They’re going to spend about 2.4 seconds looking at it, say “it’s nice,” and move on. They won’t even notice a missing heart shape. We have to be realistic sometimes. Since the inside of the 5×7 cards were so big, I felt I needed to cut down the writing space a little. Nobody needs that much room to write a short, non-effusive thank-you note. I decided to stamp some corners (maker unknown) on the inside in Stampin’ Up’s Soft Suede ink, which matched the keys pretty well. I stamped them freehand without measuring, so they may be a little off. I’m choosing not to find out. So cards 2 and 3 didn’t take as long as card 1 did, thankfully, though they are much simpler and not really my preference. I like details…but to move along in the process, simple cards are a necessity sometimes. I’m learning to appreciate them.